Hybrid cars are hot right now, but the idea of a true plug-in hybrid -- one whose owner would literally plug it into an electrical socket at night to charge the battery -- still seems years away. But not for school buses. Plug-in hybrid buses are already here, according to this story from the Christian Science Monitor. And the demand for these cleaner buses has shot up in just the past few years. When [Ewan] Pritchard, a mechanical engineer, unveiled his plan to a major bus manufacturer in 2002, snickering officials nearly laughed him out of the room. That was before hurricane Katrina hit, and diesel prices skyrocketed. "When we first talked about this, manufacturers acted as if we were asking them to build flying cars or something," says Pritchard, hybrid program manager for Advanced Energy, a small nonprofit energy-consulting company in Raleigh, N.C.
That laughter has subsided. Now, the nation's biggest school-bus maker has orders for 19 buses from districts in 11 states - including Washington, California, Texas, Iowa, Arkansas, and North Carolina. These buses are much more expensive -- more than double the cost of traditional models. That means they won't make up for their price tag, even with the anticipated fuel savings. 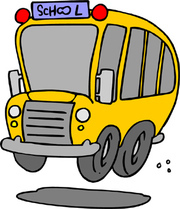 But as more schools order them, the buses can be mass produced, which would lower prices. The potential is amazing: These buses could cut national school bus fuel use by half, a savings of about 275 million gallons of fuel annually. "The school-bus industry is usually 10 to 12 years behind," says Bill Schroyer, director of fleet management for the Florida Department of Education. "It was a surprise to see them do this and jump ahead. From the plug-in standpoint, we're ahead of the auto industry."